If you notice your stream drop while broadcasting, you can restart the stream within STAGE TEN. 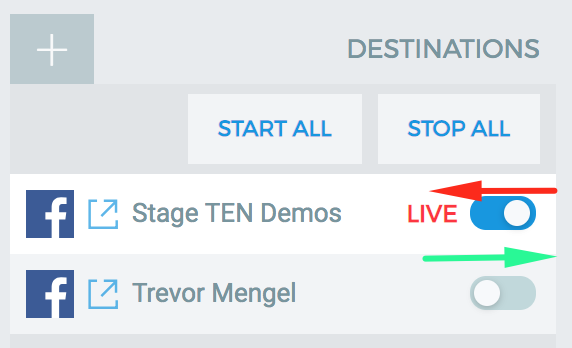 To restart your stream in STAGE TEN, go to Stream Control (botton right in the Studio) and toggle off the individual destination, or click 'Stop All'. Once you have waited 5 seconds, you can begin a new stream by clicking 'Start All' or toggling the individual destination to the right. STAGE TEN will indicate when the platform is once again streaming Live, as demonstrated below.